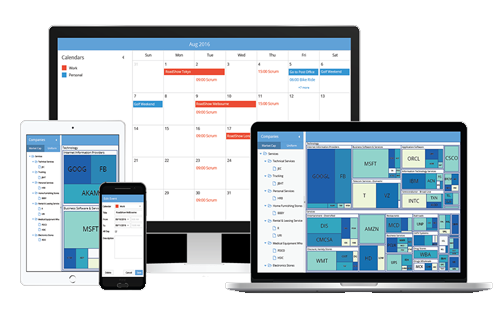 Ext JS features 115+ high-performance, pre-tested and integrated UI components including calendar, grids, charts and more. The Ext JS Grid and Advanced Charting package can handle millions of records with ease. The framework includes a robust data package that can consume data from any back-end data source. With Sencha Pivot Grid and D3 adapter, organizations can add leading-edge visualization and analytics capabilities to their web applications. The rich set of Ext JS tools and themes help improve development productivity and accelerate the delivery of great looking web applications. Tools are available to help with application design, development, theming, and debugging as well as build optimization and deployment. The D3 Adapter enables you to add sophisticated Data-Driven Documents package (D3) visualizations such as heatmaps, treemaps, sunbursts, and more to your web applications. Now you can create dynamic visualizations that not only tell a specific story, but also help your users to explore their data and understand what stories it has to tell. The Ext JS Charting package allows you to visually represent data with a broad range of dynamic and static charts — including line, bar, and pie charts. The charts use surfaces and sprites developed with a drawing package implemented using SVG, VML, and Canvas technologies. Browser variations are handled automatically, so the charts always display correctly. Ext JS Charts also support touch gestures on mobile devices, thereby providing enhanced interactive features to the charts such as pan, zoom, and pinch.